Update, August 22: It’s taken a little more than a week for World of Warcraft secret hunters to find Battle for Azeroth’s hidden Diablo-themed pet. Battle for Azeroth has been out for a little over a week, but the community’s tireless secret hunters have wasted little time attempting to find a hidden Hivemind mount. So far, they’ve not been successful, but they have stumbled on something else – Baa’l, a hidden Diablo-themed battle pet. 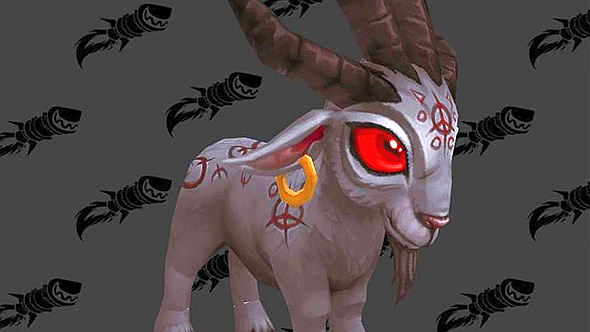 Baa’l is a disturbingly adorable demon goat pet, with flavour text uncovered by dataminers before launch reporting that “Not much is known about this otherworldly minion.” You can get a better look at him via Wowhead. With an allowance for apostrophes and animal punnery, Baa’l is a name that certainly evokes Blizzard’s demon-focused franchise. Baa’l, who’s the first secret to be discovered in World of Warcraft’s latest expansion, was uncovered at the end of a lengthy pebble hunt, which involved small items hidden throughout multiple zones in Battle for Azeroth. Once you’ve found him, you’ll need to defeat him in battle. As edgy as that sounds, it’s utterly meaningless to me. Hopefully it’ll help those secret hunters out a little, however. Head over to Warcraft Secrets for a hand uncovering Baa’l for yourself, or to join in with uncovering some of the other secrets hidden throughout Battle for Azeroth.